Buying a major new woodshop machine is always exciting. But sometimes a small, minor tool can be just as much fun to look forward to. 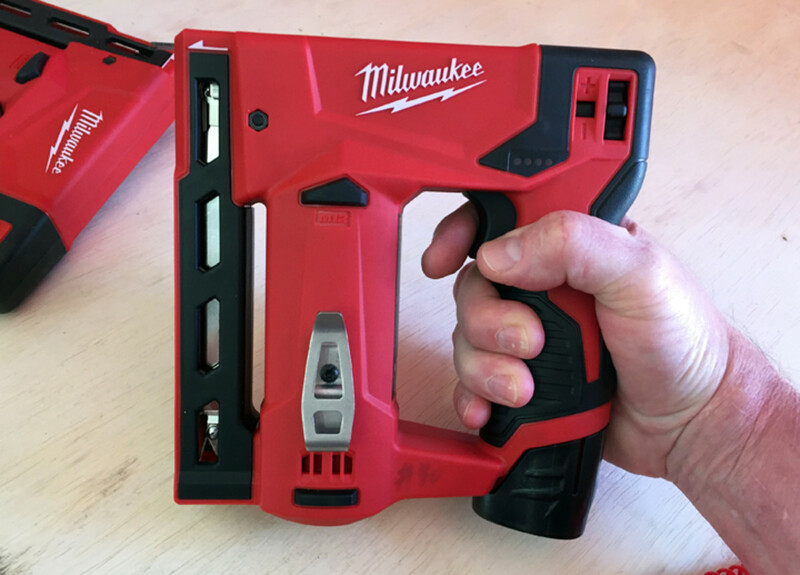 This summer I attended a new-tool symposium put on by Milwaukee Tools. They introduced a bunch of new stuff – much of which you’ve seen in the pages of Woodshop News – and I was impressed by all of it. But the one that caught my eye on a personal level was a pretty simple tool: this little cordless stapler right here. What you’re looking at isn’t a heavy-duty tool for construction or anything like that, just a very light, 12-volt stapler for T-50 staples. Those are those ubiquitous staples with a thousand uses intended for standard squeeze-type staple guns. I’ve talked before about the difficulty I have with tools that require squeezing, so I was immediately interested. Add to that the fact that it’s light as a feather (well, a 3-1/2 lb. feather, but way lighter than anything else like it on the market), has both single and bump-fire modes, and costs less than a hundred bucks for the bare tool – and it looked like a winner to me. Further, since I just happen to be planing to install a tile ceiling in my new workshop, which will require firing zillions of staples, I couldn’t wait to buy me one of these. Well, the release date for the stapler has come around and I wasted no time getting one. Sure, it’s not a major exciting purchase like a new table saw, just a little exciting one. And this woodworker can always use a little excitement in the shop.